As we head from winter into spring, the garden suddenly comes alive with colour, bird song and the buzzing of bees. 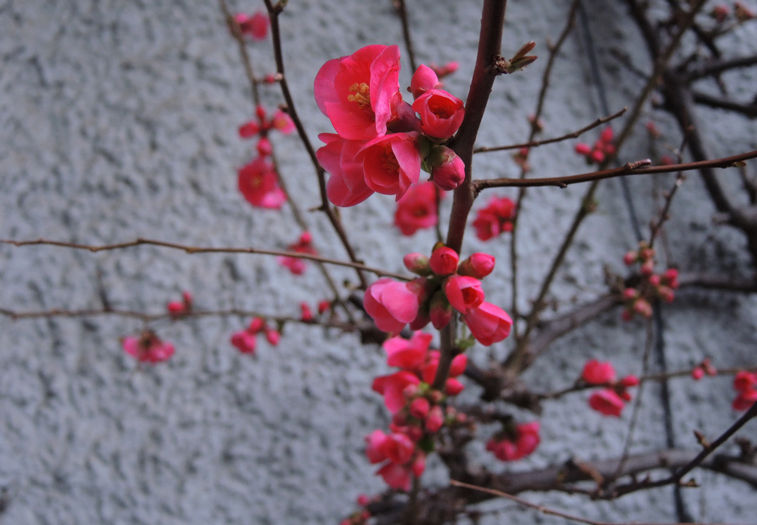 One of the first shrubs to blossom in this garden is the quince. Quinces belong to the family Rosaceae, as do apples and pears. The quince was cultivated by humans before apples and pears and it is thought that many historical and biblical references to apples are mistranslations of quince. This particular quince is known as a flowering quince, a thorny shrub grown for decoration, although it still produces fruit. The fruit contains more vitamin C than lemons. Quinces originated in Asia, but seem able to grow anywhere. The first recorded planting of quince in England was in 1275 when Edward I grew them at the Tower of London. 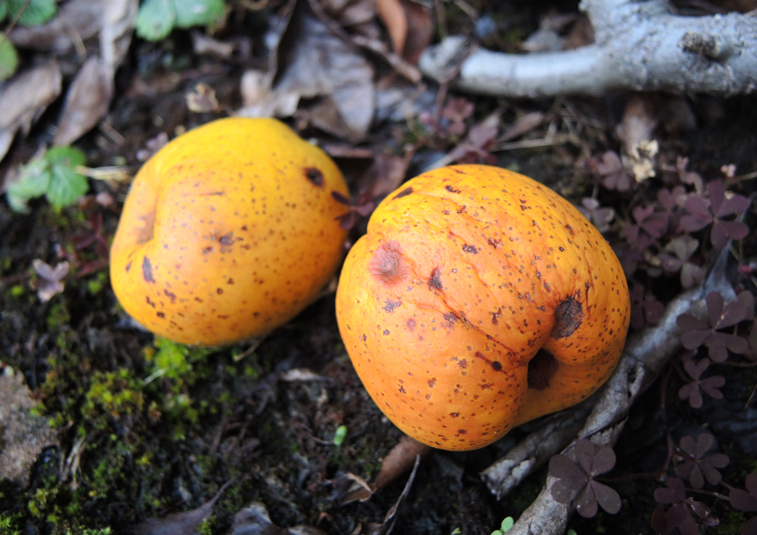 Quinces provide a food source for various species of Lepidoptera. 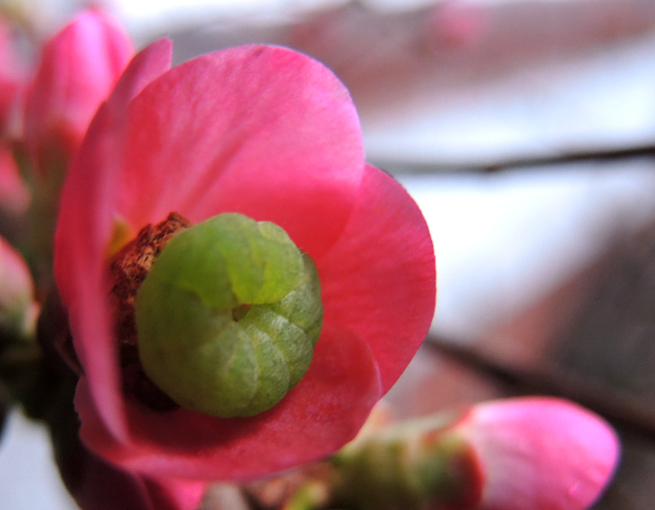 Indeed in this photo you can see a little caterpillar having a snooze, very badly camouflaged against the pink blossom. I have been reliably informed that this is probably the larva of one of the Angle Shade moths. As it is full of natural pectins, the fruit is often used to make liqueurs, jellies and marmalades. Indeed marmalade comes from the Portuguese word, “marmelo” which means quince. For the culinary talents out there here are some links to recipes you might like to try: Quince Marmelada here, Japanese Quince Jelly and a Chutney here, and a wild Quince Jelly with a link to sloe gin here. The fruit is associated with Aphrodite and is considered to be a symbol of fertility. Greek brides would eat quince to aid pregnancy. Personally I just think it is a very pretty shrub to have climbing up the wall and if it helps out our little moth friends then that is a bonus. This entry was tagged Angle Shade Moth Caterpillar, Aphrodite, Edward Lear The Owl and the Pussycat Poem, Flowering Quince, Quince, Quince Jam Jelly Marmalade recipes. Bookmark the permalink. 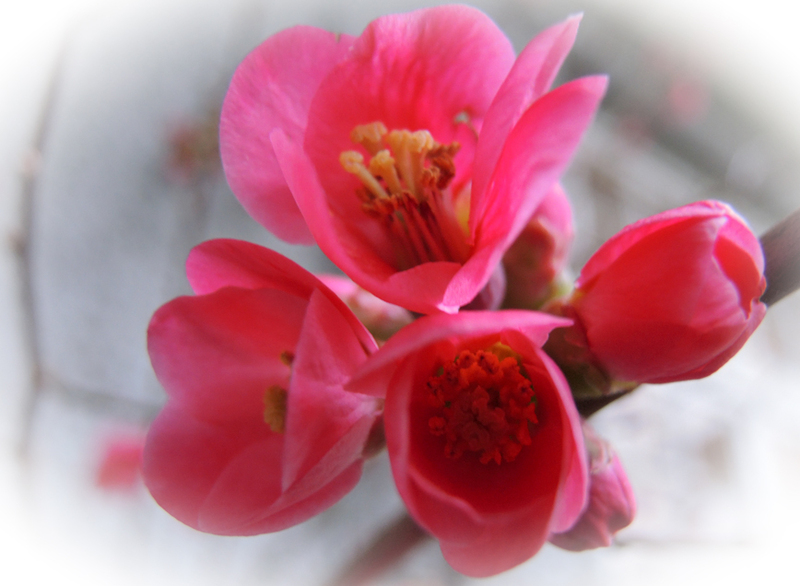 We left our flowering quince behind last time we moved house – I must get a new one!